Riley Mayes is currently a junior at Waynflete School in Portland, Maine. She has always had a passion for the written word, especially as means of communicating with others. 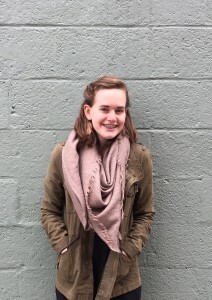 She first heard about Writing for Peace through her English class, which inspired her to compose a piece where she hoped to emphasize the importance of the two causes she cares most about: social justice and human rights. It is her ambition to one day combine her love of writing and fighting for change by studying law. Smiling at Strangers” is special because of the way in which the author depicts her own dynamic change of heart. At the beginning of the piece, we get to know the author through her own mother’s advice: never smile at strangers. This message is ingrained in her as a way to protect herself from unwanted and perhaps dangerous advances by men. The director of the soup kitchen offers contradicting advice. “Serve potatoes and smile.” As Riley dishes out food, she finds herself smiling and is puzzled by her own actions. She examines them and learns that the barrier of the table is one reason why she felt safe to smile. But the author hints that there might be more at work. The reader is left wondering who else Riley might smile at. She sees that sometimes smiling is the right thing to do. Mayes’ powerful line-by-line narrative writing and her strong character development earn the second prize. Riley’s winning essay will be featured in our 2018 edition of DoveTales, An International Journal of the Arts.